Venturing into the wilderness at any point in life will have an impact on one's personality and lifestyle. It is always an adventure, and it is always dangerous. When Rick Bass and his then girlfriend Elizabeth rode their truck over a severely rutted road into the outback of northern Montana, they were planning to spend their first winter among glaciated mountaintops, moose, and big trees. They made this leap into the wild almost entirely unprepared. 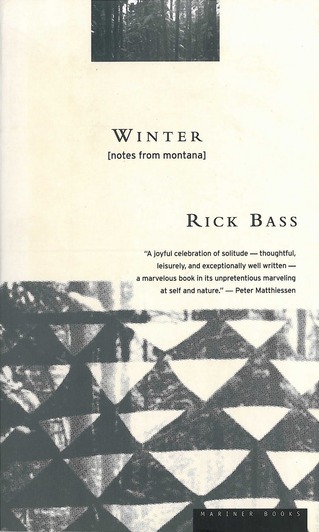 In his memoir Winter, Bass chronicles the first year spent snowbound in Montana. As he begins, he makes no attempt to hide the fact that he and Elizabeth were "wondrously poor" or that "the sharpening of a pencil [was] an adventure" for them both (Bass, 2). These admissions of helplessness are rare, in my experience, particularly for a male author, and particularly on page two. Being someone who appreciates being in control of my daily outcome, I find the wilderness a challenge, wilderness being in all cases that place beyond the borders set, excavated and marked, by civilians. Everything past those straight lines and fences is wild, and chaos springs eternally in the wild, like ragweed or eucalyptus. Over the years, though, I've realized that if I pass through the gate and into those less charted territories feeling even slightly prepared, I enjoy the journey into chaos much more than I enjoy any stroll down any sidewalk. That said I have had the opportunity to read many books which might count as wild, less controlled than the rest because their narrators are unreliable or their settings entirely unfamiliar. If I don't trust the author to guide me on the hunt, I find it difficult to enjoy myself as a reader. This has fueled a way of writing in my own life which is confident to the point of arrogance. I only write about what I know. If I don't know, I don't let on; I'd rather fake it, draw a line, stake out the high ground and hold it. This, upon completing Winter, I believe to be to the detriment of my writing. Following Bass into a remote valley felt strange at first, almost unstable. He describes the cabin where he and Elizabeth set up housekeeping that year. Standing on the front porch, "You can hear sounds from a long way off: the dogs chewing and gnawing like bears on some deer legs they found near one of the old butchering cabins; birds whose names I don't know, birds back in the woods" (Bass, 9). The level of silence required to hear all of this is mighty, almost threatening. As the dogs rip at the venison, I am gripped by a primal thrill, something akin to terror. What have we, Rick and I, gotten ourselves into? Looking to him doesn't inspire much confidence. He doesn't know which birds are singing in the brush. By page twelve he's already admitted that he doesn't know how to write about Yaak, this wild country. "If a path develops, I'll be glad to see it--as with math, chemistry, genetics, electricity, things with rules and borders--but for now it is all loose events, great mystery, random lives" (Bass, 12). I should run, should grab my snowshoes and head into town to find someone more experienced to guide me, but instead I take Rick's hand and follow him forth. I think this is because the most trustworthy man turns out to be an honest one. Bass's honesty isn't self-deprecating; it's a reminder that he's being alert. And to his credit, he picks up the little tips and tricks to back country survival quickly. He ticks off the list as he goes along through this journal, reminding himself to wear boots and baggy pants and to "check the antifreeze. This is a simple, stupid thing that someone from easy times, from the warm simple growth of Mississippi might easily forget" (Bass, 17). Noted. His willingness to admit that he didn't know this, never diminishing what the consequences of forgetting such things could be, earned him my trust. I followed him, albeit more alertly, ready to protect myself if need be. The story continues this way, Bass and Elizabeth are the "The lucky, stupid, foolish pilgrims," and I am among them. My experience as the reader is at eye level with Bass's own. We all wonder at times whether "the land [is] beginning to turn on us? Is it, just now, noticing our presence, a land that admits few into it, and keeps fewer?" (Bass, 119). My wonder is acute, as sharpened as Bass's own precisely because he hasn't shielded me from anything along the way. I sit in the greenhouse where he writes and I notice when he does that "The greenhouse smells funny... some large mammal was in here not long ago and probably left at daybreak. It smells like a wet dog--coyote? wolf?--and it's pretty strong, not the smell [we're] used to" (Bass, 78). We're guessing. And that's okay. Our curiosity keeps us from drifting off to sleep, from forgetting the important stuff, like always packing an axe in the truck. If we don't, and a tree falls across the road in a storm, we could be stranded in the wild. Bass knows that "theoretically a mistake like that - forgetting - could kill you" (Bass, 104). Even phrased in that true and dire way, though, Bass's Montana is "beginning to feel more like home" for us both, "and there's that danger of complacency, especially in winter" (Bass, 119). That's the difference I discovered, that my writing, my attempts at omniscience and my protectiveness of my reader, could lead to complacency. And complacency, much like contentment, is usually boring, especially in long doses. I write about some wild things, scaling cliff sides and backpacking in remote locations, wading deep into icy rivers to call to the trout, but I guard my readers from anything that might smell like confusion, ignorance, innocence, or fear. I want them to follow me to hell and back because they trust me to survive it for them. What I learned from Bass is that, as a reader, I wanted him to survive his winter with me. In the end, Montana captured Bass's imagination and heart for the long haul. He had wintered in Yaak, and was, therefore, granted a sort of citizenship by the other rugged folks in the region. Today he knows what to wear on treks up the mountain, to keep an axe in his truck cab, and he never forgets to check the antifreeze. Today I know that admitting my own shortcomings and shortsitedness in my writing isn't a bad thing, that in calculated doses it can be considered endearing, and I will try not to forget to let my readers see things from my eye level, even allowing them to hear the quickening of my heart as I dangle above the valley floor. "It's taken me a long time, but I'm finally learning" (Bass, 151).